The new Flow magazine has optimism running through it from start to end. There are articles on the joy of rainy days, the benefits of thinking smaller, and the joys to be found in joining the sharing economy. We are introduced to Lotta Jansdotter, a pattern designer, whose aesthetic is deeply rooted in her native Aland Islands, chat with Sadia Vink about her living mobiles and find out about the wonderful American painter Maira Kalman. as usual, there is plenty to keep your creative juices flowing. There is advice on keeping an art journal, dessert recipes to master and a full page Art Nouveau inspired window decal by illustrator Esther Horchner. 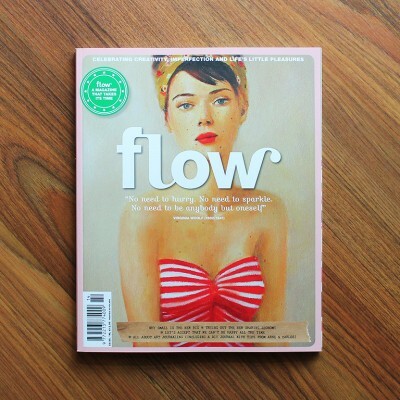 Flow Magazine celebrates ‘creativity, imperfection and life’s little pleasures’. With regular sections centred around being connected, simplifying your life, spoiling yourself and mindfulness, Flow provides a way to slow down, take your time, take comfort in small pleasure and … get crafty with loads of papery goodness. It is always great to see our favourite illustrators crop up in Flow, and Ruby Taylor’s illustrations which accompany the veggie soup recipe are ace.